Video sharpening can overshoot or artificially increase the height and width of an edge element during image processing. Video Sharpening is used in video processing to make edges and texture transitions steeper and enhance subjective video quality. However Linear Sharpening can also create the phenomenon of overshoot. 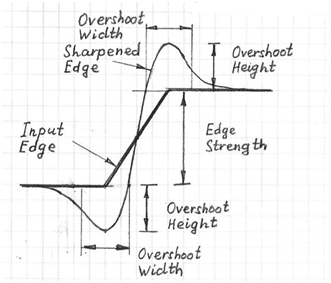 The basic characteristics of overshoot are its height and width with respect to the unsharpened edge. For a given edge, the stronger the sharpening level the steeper the output edge and the greater the height and width of the overshoot. Also, for a given sharpening level, the stronger the edge the greater the width and height of the overshoot. To the human visual system, the overshoot may cause a visible “halo” artifact. To improve the image quality, the height and width of the overshoot have to be controlled. To do this, nonlinear processing has to be combined with linear sharpening. The perceptual video quality is increased by narrowing the overshoot width as well as decreasing its height. For some applications where a steep edge is surrounded by completely flat areas of the video frame (for example computer graphic objects) the overshoot may be completely removed. However, completely removing the overshoot for natural video/images can cause an unpleasant “flattening” artifact that makes them look more artificial. There is an optimal value of overshoot width and height for a particular edge strength that creates perceptually good image quality. Weak edges may be considered as details of the image. Their overshoots are small and should be left untouched to have good image quality.